Spotwise today announces the availability of “Pendla i Göteborg” (Swedish for “Commute in Göteborg”). The app makes it possible for commuters in the greater Gothenburg area to check the number of available parking spots at nearby commuter parkings. The app is now available on the Swedish App Store. For more information, please see the product page. Almost exactly eight years ago the late Steve Jobs presented the iPhone at MacWorld 2007. “It’s a widescreen iPod with touch control, a revolutionary mobile phone and a breakthrough Internet communications device”. The audience was enthusiastic, yet very few fully realised the impact this would have on an entire industry. As a phone and compared with what we have today it was lacklustre. There was no app store, that was to come much later. And as far as connectivity goes it was inferior to other phones, having only 2G connectivity. You could not copy and paste text when texting or writing email, nor attach photos. Which was probably just as well, since the camera was only 2MP and produced rather ordinary photos and no video. And, like the T-Ford, you could have any display background you wanted as long as you wanted black. We all know what happened. The iPhone improved by leaps and bounds. An app ecosystem virtually exploded around it. The connectivity has since vastly improved and the performance is now hugely better thanks to Moore’s law. In the process it completely obliterated a number of industries and companies. Nokia, the biggest phone manufacturer at the time the iPhone was introduced has since succumbed due to their inability to see and act on the shift in their industry. But the impact of the iPhone was not limited to the mobile phone industry. The iPhone is today the go-to-camera for most people and there is now very little need for a standalone GPS to find your way. This spring Apple will release the Apple Watch to the world. And even though it mostly likely is a magical device that will find its place on the arms of many people (mine included) it is probably wise to see the future evolution of Apple Watch in the light of the history of the iPhone. It may not take eight years for the Apple Watch to find its true form but we will no doubt look back on 2015 a few years from now and realise the shortcomings of this, the first generation of the Apple Watch. The Apple Watch of 2020 will no doubt be very much thinner than the first generation, charge seamlessly and run for weeks on a charge, be connected with everything around you and have a colour display that is always on. The first generation will require a phone to run apps but it is not hard to imagine that this requirement will be dropped in later revisions. 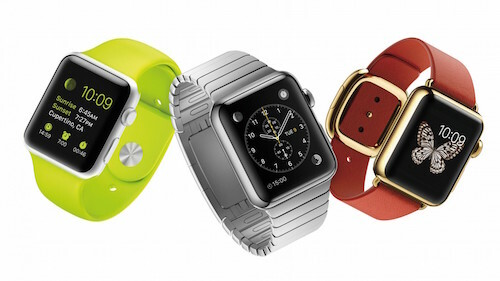 When this happens it will be the beginning of the end for other watch-like offerings for runners, golfers etc. Make no mistake. The release of the Apple Watch this year is not just for a watch but of a new product segment that will profoundly change several industries just like the iPhone has done before it. Many companies that fail to transform their business will go under but many other companies will flourish based on applications that we have yet to imagine. Now, I just hope that spring comes early this year.